In San Juan County, Colorado, the effects of historical mining continue to contribute dissolved metals to groundwater and surface water. 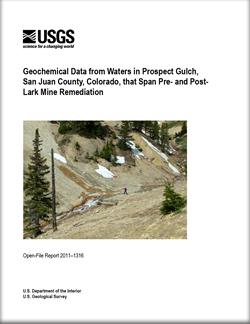 Water samples in Prospect Gulch near Silverton, Colorado, were collected at selected locations that span pre- and post-reclamation activities at the Lark Mine, located in the Prospect Gulch watershed. Geochemical results from those water samples are presented in this report. Water samples were analyzed for specific conductance, pH, temperature, and dissolved oxygen with handheld field meters, and metals were analyzed using inductively coupled plasma–mass spectrometry. Johnson, R.H., Yager, D.B., and Johnson, H.D., 2011, Geochemical data from waters in Prospect Gulch, San Juan County, Colorado, that span pre- and post-Lark Mine remediation: U.S. Geological Survey Open-File Report 2011–1316, 4 p.